Join the 3R Revolution Today! "Today marks the first day of a new revolution for freedom in America..."
The health care vote may be over, but the fight is not. We must resist, repeal and reclaim America's health care system. This is not optional. Nor is it impossible. The combined energy and support of freedom-minded Americans like you is the key to success. Citizens' Council for Health Freedom's "3R Revolution" needs you! Join the 3R Revolution to learn how you can help win this essential fight for health care freedom. 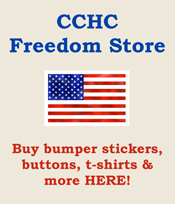 Purchase 3R Revolution Merchandise at the CCHC Freedom Store!